Nye Ozone Connect pro er et allsidig sittetrapes for alle typer kiting. Trapeset er nok best egnet for turkiting da man har mulighet til å feste Ozone-sekken fast i trapeset. [gallery columns="4" link="file" size="medium" ids="15667,15669,15670,15671"] THE CONNECT PRO HARNESS IS IDEAL FOR ALL SNOW OR LAND KITERS WITH THE ADDED SUPPORT AND EASE OF USE OF A STAINLESS STEEL SPREADER BAR. THIS COMFORTABLE WAIST HARNESS INCLUDES REMOVABLE LEG STRAPS MAKING IT A VERY UNIVERSAL HARNESS ON THE SNOW OR LAND. Designed for comfort, support and flexibility in use, this harness is perfect to wear over or under your snow gear. Featuring high quality Aluminium adjustment buckles on the spreader bar and leg straps. The Connect Pro has been designed like a rock climbing harness so that it will not ride up. Spreader bar - The Stainless Steel spreader bar attaches directly to both the harness and the leg straps reducing spreader bar upward tilt. Extra padding and neoprene covered for comfort. Aluminium buckles - High quality extra strong aluminium adjustment buckles are easy to open and close. This makes fitting on the harness very easy even under snow gear. Smooth adjustment reduces wear on webbing. Ergonomic shaping - Increased support through wider and improved ergonomic shaped panelling. The load is distributed evenly over a larger area. Strong internal structure - Plastic layers along the back section with full length webbing support for ideal load distribution and extra strength.Removable leg support straps - Color coded, thin and light yet comfortable leg straps with neoprene lining for a strong grip/hold on winter clothing. The leg straps are connected at an ergonomic angle distributing vertical loads between the attachment point and leg padding. They can be easily removed or fitted under your snow pants without having to take them off.Comfort grip fit - Extra padded areas for increased comfort and neoprene lining for a strong grip/hold on winter clothing. It also protects better against the cold.Technical backpack connection - Female buckles on each side connect directly with Frenzy and Summit technical backpacks. Simply unclip the waist strap from the backpack, remove it and click the bag straps into the harness.Kite leash attachment - Easy to access front kite leash attachment.Webbing loop attachments - Attach a grab handle or ropes for pulling sledges to the webbing loops on each side of the harness.One size fits all - Fully adjustable to fit all shapes and sizes, both under or over clothing and outer winter layers. THE CONNECT BACKCOUNTRY HARNESS HAS BEEN DESIGNED FOR COMFORT AND SUPPORT WHILE REMAINING CLEAN, SIMPLE AND LIGHTWEIGHT. This comfortable waist harness with leg straps is ideal for experienced backcountry snowkiters venturing deep into mountains, or riders looking for a lightweight comfortable fit alternative to the classic spreader bar system. 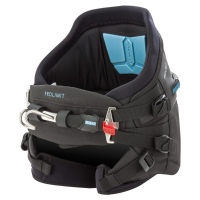 The Connect Backcountry has been designed like a rock climbing harness so that it will not ride up. Webbing chicken loop connection - Heavy duty webbing loop to connect the chicken loop, reducing size and weight of the harness. Three step connection - release chicken loop, feed loop through webbing, reload chicken loop. Ergonomic shaping - Increased support through wider and improved ergonomic shaped panelling. The load is distributed evenly over a larger area. Strong internal structure - Plastic layers along the back section with full length webbing support for ideal load distribution and extra strength. Leg support straps - Color coded, thin and light yet comfortable leg straps with neoprene lining for a strong grip/hold on winter clothing. The leg straps are connected at an ergonomic angle distributing vertical loads between the attachment point and leg padding. Comfort grip fit - Extra padded areas for increased comfort and neoprene lining for a strong grip/hold on winter clothing. It also protects better against the cold. Lightweight construction - Strong yet lightweight construction for backcountry touring – weighs only 700 grams! Technical backpack connection - Female buckles on each side connect directly with Frenzy and Summit technical backpacks. Simply unclip the waist strap from the backpack, remove it and click the bag straps into the harness. Kite leash attachment - Easy to access front kite leash attachment. Webbing loop attachments - Attach a grab handle or ropes for pulling sledges to the webbing loops on each side of the harness. One size fits all - Fully adjustable to fit all shapes and sizes, both under or over clothing and outer winter layers.